Over the years, I have collected quite a few interesting and rare examples of LSLPs. I thought it would be fun to share a few with you. Some, like the Bigsby clad, gold painted Les Paul Custom are confirmed. Others, like the white Les Paul Custom are not. As I have, if you come across oddities like this, know it is nearly impossible to confirm them, so don't assume what you have found is legitimate. 99.999999% of LSLPs I have seen are black Les Paul Customs and gold Les Paul Standards/Deluxes, so chances are yours has been refinished/modified, etc. We also will examine the idea that the First Reissues could have been made with leftover bodies from the end of production in 1960 (1961 for Les Paul Customs). "High" has a double entendre in this case. 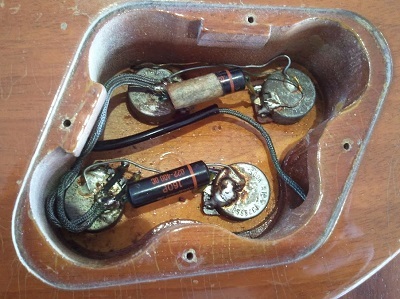 A few super early LP Standards (possibly on Customs as well, although I have not seen one) have a misplaced, high strap button as seen in this image. The other meaning of "high", in this case, is probably what the person was when they thought doing so was a good idea. :) It is VERY easy for these to slip out of a strap. In total, I have probably only seen a total of 10 or so of these over the years of keeping a look out. Just speculation, the misplacement of this button could just be a sign of teething problems as Gibson resumed single cutaway LP production. Funny side note, almost every one of these guitars except the ones pictured here has its button relocated in the interim by a player or luthier. Unfortunately I did not save this image, but I recall seeing one or two of these that had been corrected AT THE FACTORY. The higher, misplaced hole was doweled and factory clear put over it. For those wondering, the tight grouping of super early serials on these guitars is why I believe this to be a factory goof and not a later mod. You just do NOT see it done later than maybe 510xxx or so. Also, look below for the "Hidden Flame", stripped GT below. It also has the high button and is a very early, "First Series" LSLP. I have also seen even fewer guitars with factory SG style (back of the neck joint) positioned strap buttons. I believe one had what appeared to be a factory repair, and the other still had its button there with NO OTHER HOLES where it SHOULD be. Crazy, eh? What a great guitar! Confirmed via the ledger and the warranty card. A mid-1969 example with 6852 pot codes, and a 565xxx serial match with it's shipping date. I cannot confirm whether or not this particular Bigsby is the one that it shipped with as I do not know Bigsby's that well. Unfortunately, I can't remember where I found these pictures! It has been years since I found them, and I do not remember whom they belong to. I put the my URL as a watermark on them to make sure no one tries to do a fake Ebay auction with them out of respect to whomever it belongs to. Typically, Les Paul Deluxes only had the word "Deluxe" on their truss rod covers. Pictured below is another acceptable variant. In this case, it is on an 814xxx guitar. 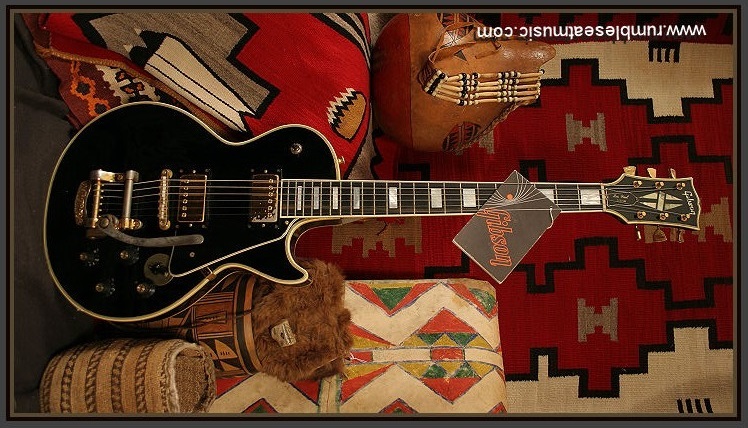 Brian, Manchester UK, was kind enough to reach out to me about his 526xxx Les Paul Custom. He wanted me to know that Gibson did ship some LPC's with Grovers. He is an original owner, and the guitar was bought at his own retail guitar store back in '68. Sounds like a reliable source to me. 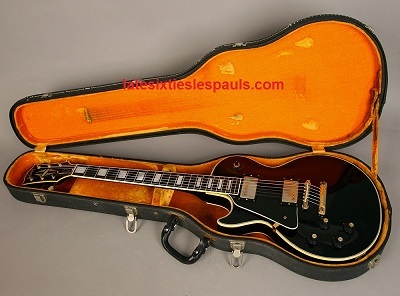 :) Anyway, his guitar was shipped in what sounds like an Alligator print, cardboard, Les Paul Jr. case from the 50's. Wild! Thanks, Brian. From Rumble Seat Music, this is a 1969 Les Paul Custom with a Vari-tone and a Bigsby! Pretty wild. 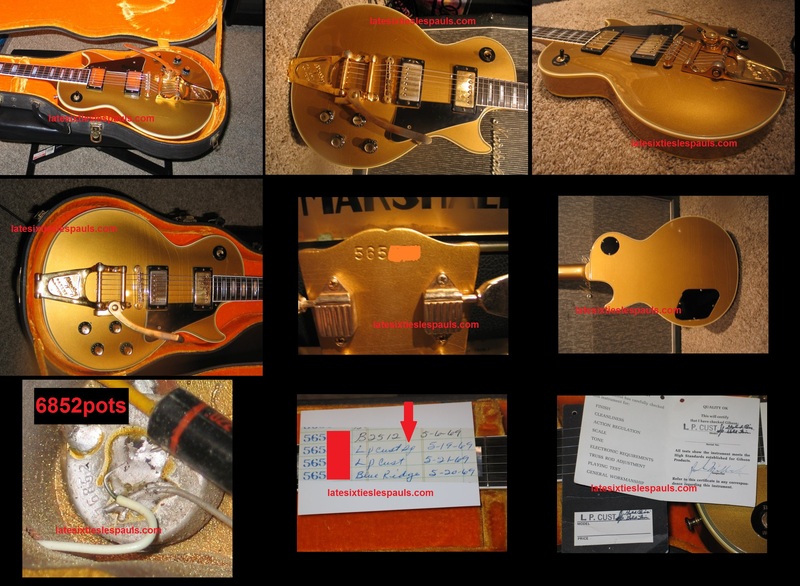 They did not post any pics of documentation for this particular guitar, but they are a well known retailer. 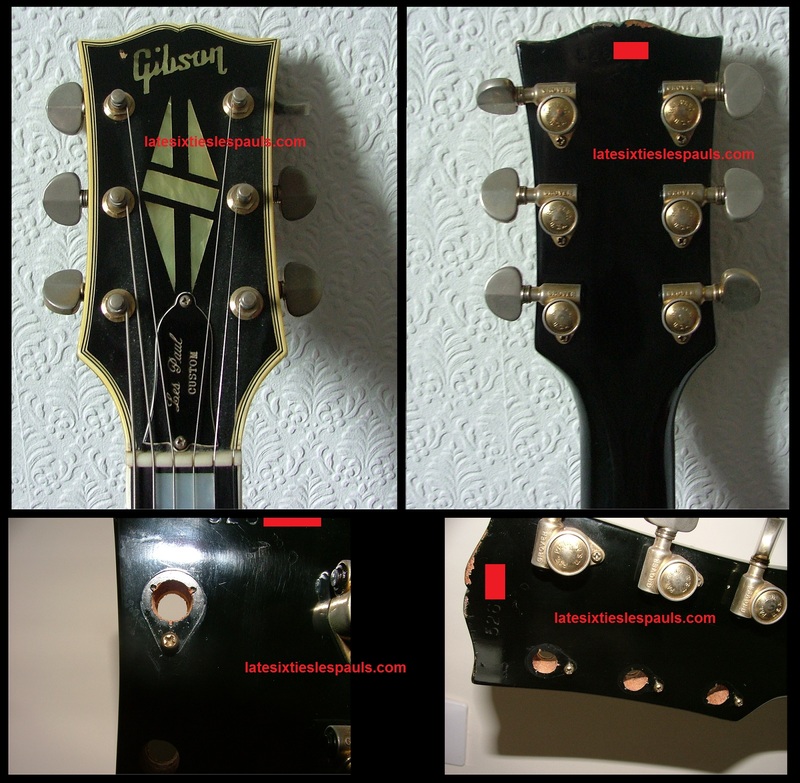 Yes, Gibson made lefties VERY, VERY late in 1969; basically you could call them early 1970. All the ones I have seen have been in the 892XXX or 893XXX series. Like 50's lefties, they have dot markers on BOTH sides of the neck. 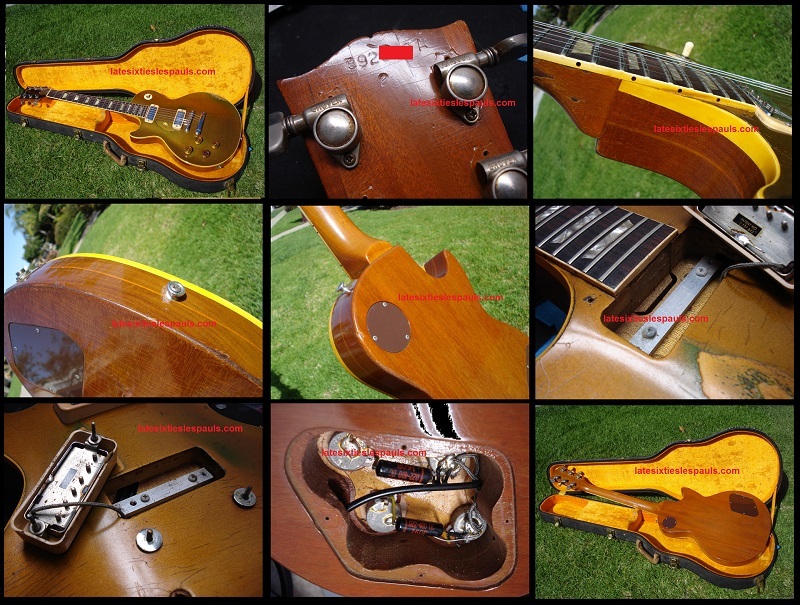 Concerning Les Paul Deluxe models, this particular example has changed tuners, changed knobs, changed truss rod cover, and a missing pickguard. It has a dot-less, open b and o logo. This one has a serial number format that I have NEVER seen. It has an "A" at the end of the serial! The "2" below the serial is something I have seen before. Some of you may call it a "second", but it was also used to label special orders as in this case. Our second example, is an 893XXX LPC with an orange lined case (a later variant with all modern latches, but with a replaced handle). 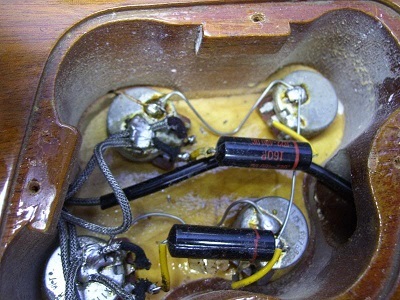 I have included a picture of it's lefty wiring. I also have pics of a lefty 893 LPC with a purple lined case, also correct for such a late LSLP. 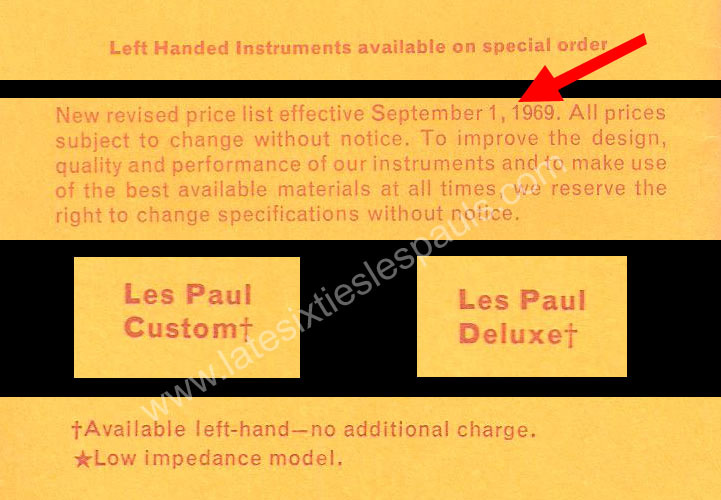 Confirmed now with a recent period literature find, lefties were available for order beginning around September of 1969 at no additional charge. This was post-Norlin buy out. As previously stated, all lefties I have seen are from the 892 and 893 prefixes. SPECULATION: Gibson assembled them in a "batch" after waiting for enough orders. This price guide went out in September of '69, and the lefties known to exist shipped in the November / December time period (approx). That would make them about a two month turn-around for filling special orders. Not bad! I have compiled an image from a scan I took of this original price guide. 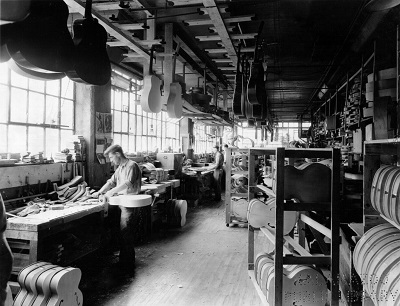 Although Gibson had begun taking orders for the new LP Personal, Bass, and Professional models, none were available in Left-Handed variants per this document. Cool stuff! 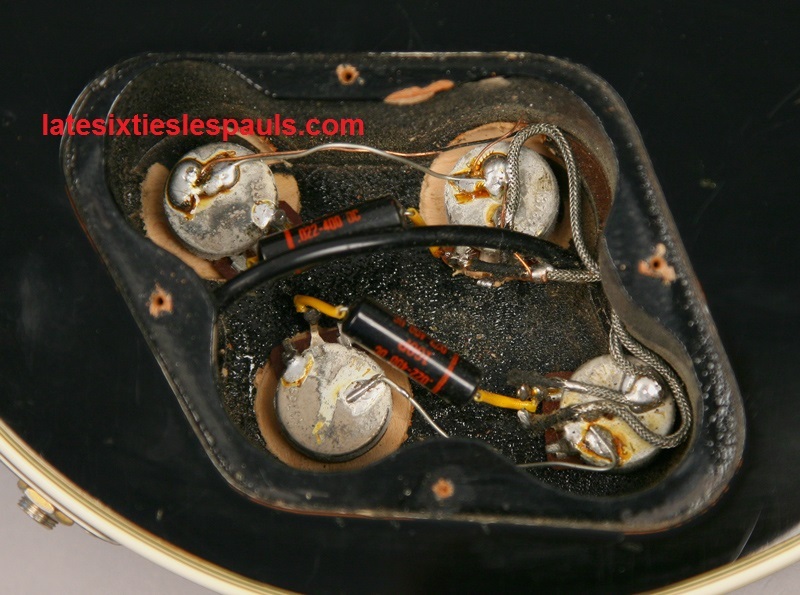 Although First and Early Reissues have center seamed stops like late 1950's Les Paul Standard Sunbursts do, they didn't need flamed maple as they were painted gold and black (for LPC's). Therefore, Gibson wouldn't pay extra for flamed wood. This particular guitar, a SUPER early 985xxx Standard model, has a beautiful top that almost looks bookmatched. This is very, very unusual and would not have been noticed if the gold paint had not been removed. Thanks Lee from the UK for the pics!!! Its serial is 985xxx. Note: it has the "high" strap button mounting position as well. 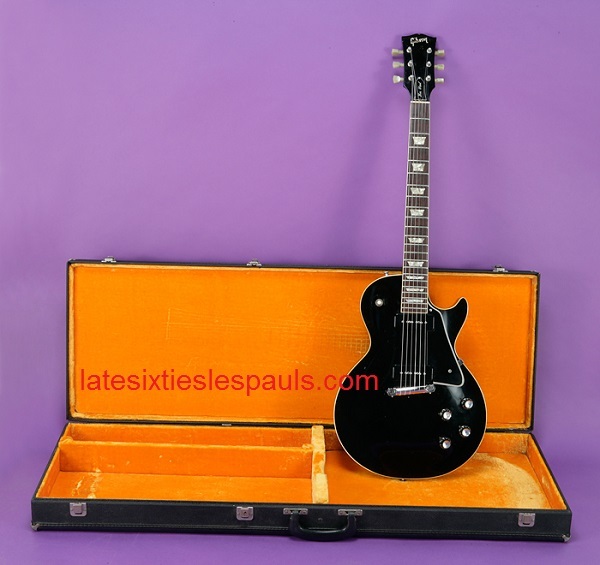 Les Paul Standard: All black, wraptail??? I don't remember where I found this, but the seller claimed it was a '68 special order. It is all black, including the back of the guitar. I have no idea whether this is real or not, but I think we can agree it is BEAUTIFUL. Note, it has the sharper angle to the bridge as a 50's guitar would. Gibson tweeked this a bit, for the better, on the 1954 reissues. UPDATE: It is owned by John Shanks, as of February 2015, who claims it to be a 1967 example.... It was posted on his Instagram page. Some documentation would be interesting, haven't seen any. From an ancient thread at the LPF if I remember correctly. Do note take this following as fact as it is based on an old memory :)... 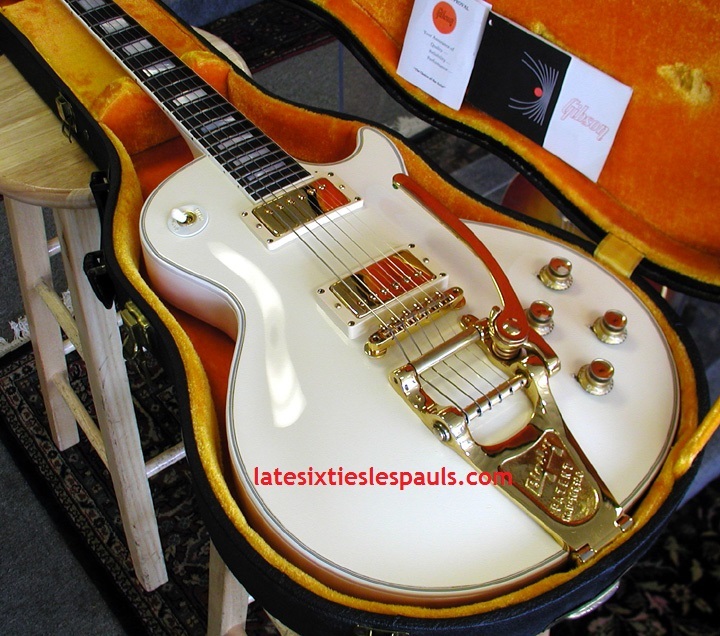 I seem to remember that the story for this guitar was that a preacher custom ordered it in white for use in his church band. It was ordered with NO CLEAR COAT so that it wouldn't yellow. The reason it looks so perfect still was that it proved too heavy, and he only used it briefly then put it under his bed. It is supposedly a 1968 example, but I do not have any records of what its serial number is supposed to be. I wonder if those are 50's, M-69 pickup rings. They are worth a fortune!!! The Weird Control Cavity: What the???? A true oddball here. Looks like someone goofed with the router at Gibson around serial 533xxx. Both of these instruments are from that serial range. At first I thought it was a later mod, but the original finish is untouched and they both share a pencil line in the same place. Not to mention, I found four or five more just like this! Also picture below is an example of an LPC that even has the pencil lines as well. 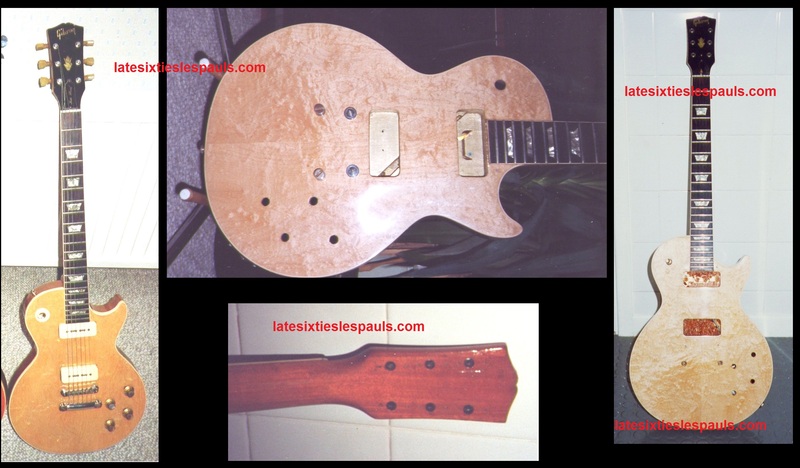 The earliest examples of Les Paul's in 1968 are made with leftover, partially completed bodies from the 1950's. 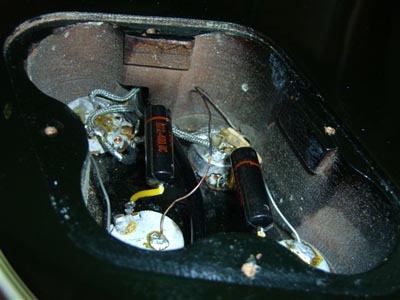 It is unlikely to the point of being impossible that leftover 50's bodies were used in 1968. Yes, both 50's and early 68 instruments have center-seamed tops and Honduran Mahogany bodies. Yes, both have long tenons and square routing channels. Also, I have read that the shape of the body is precisely the same as a 1950's one (most likely, the same body router template was used). That is where the similarity ends. 68's control cavities are no where near similar to 50's examples. 68's have flat routed walls. In other words, the walls of the cavity are perpendicular to the floor of the cavity and the back of the guitar. 50's will have pitched sides in various spots, not to mention the infamous router chew marks. The cavities are not in the precisely same position either. I'll add more content showing specifically the differences at a later date.